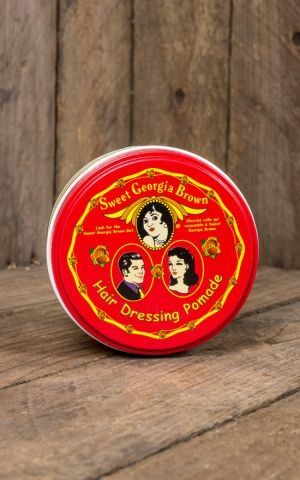 Sweet Georgia Brown is a true legend in the world of pomade. Already back in the 30s this hair styling product with strong hold and a seductive scent was widely used and loved by men and women alike. After being unavailable for decades, this pomade is now being produced again and follows the original recipe. Also the packaging hasn’t changed, it comes in nostalgic metal tubs in unsurpassed 30s design. This pomade is the perfect product for rockabilly and swing enthusiast and everyone who loves a truly great hairstyle. Sweet Georgia Brown Red ? the original pomade ? with medium hold is ideal for beginners. It’s easy to work into your hair and exudes a subtle smell of honey. For more advanced users, we recommend the new variety, Sweet Georgia Brown Blue. It’s a tad more difficult to use, but leaves your hairstyle pretty much indestructible and comes with a subtle sweet scent. It doesn’t matter which of the two you select, you’ll always make a great choice. It’s a fabulous product for classic vintage and modern hairstyles.